Winter has arrived in my home state of Wyoming. For me, this signals the start of my “tying season”. 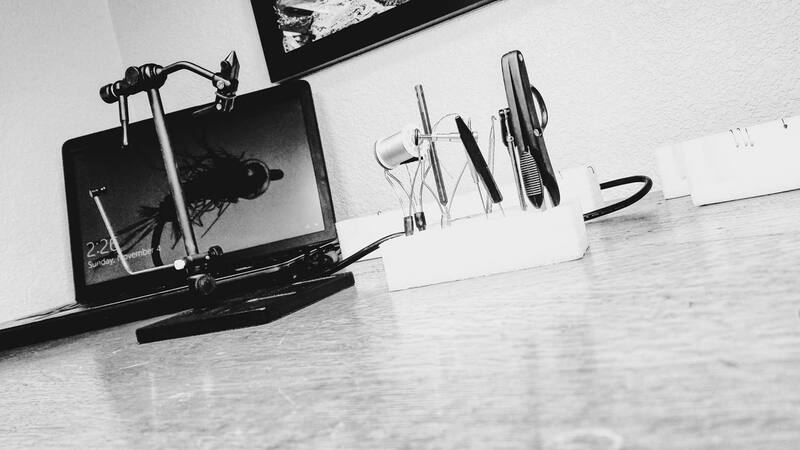 As a first step on this five month journey, I focus on the cleanliness of my tying desk. This may be a sore subject for some and emotionally disturbing for others. I’ve seen the surfaces of enough tying platforms over the years to know that they can quickly turn into a chaotic heap of fluff and debris. I’m not here to judge, just to offer suggestions on how to prevent chaos and increase the number of flies that you tie. I am huge believer in the fact that organization is the foundation of maintaining cleanliness on my tying table. When those two factors coexist, the number of flies that I am able to tie significantly increases. That organization starts inside the drawers of my desk. In the past I maintained a typical setup of dedicating different storage compartments to different materials. Over the last couple years I’ve moved away from that focus. Instead, I now use plastic organizers and Ziploc bags to group the materials that I use for specific patterns. Every pattern that I will tie has its own container that includes all of the ingredients. Anytime I add a new pattern to my arsenal, I dedicate a new container to its materials. This system allows me to simply grab the bag for the pattern that I’ll be tying. All I have left to do is slide the materials onto my desk top and begin constructing. When I’m finished, I move the ingredients back into the same container and place them into the desk. While the surface of my desk can turn into a mess while I’m tying, I always make a point to vacuum it clean when finished. This provides me with a clean slate for my next tying session. It also reduces debris that can stick to epoxy and UV resin as I apply them to finished flies. Before you dive into another winter of spinning up bugs, consider the state of your tying platform. While you may not equate cleanliness with godliness, it does affect your efficiency. Give yourself a clean slate to start with this winter and reap the reward of more flies in your box. This entry was posted in Fly Tying, The Hot Ticket and tagged A better way to organize your fly tying materials. by Louis Cahill. Bookmark the permalink. Do you keep materials that are used in multiple patterns (like krystal flash or dubbing) out on the desk? Organized any certain way? I have a zip lock bag that has all of the materials in it for each of the patterns that I tie. My desk storage is mainly full of bags separated out into patterns. If I need Krystal flash for different patterns, I have Krystal flash in each of those bags. I do have all of my hooks and beads organized in the largest of the desk drawers. If I have two or three patterns that use the same material, like a dubbing, I have that dubbing in each of the separate pattern containers. This keeps me from having to search for anything and if I happen to unexpectedly run out, I have extra in the other pattern containers. I love the organization idea to package individual patterns! What do you suggest we do for things like hackle capes etc – still keep those separate or chop up the cape to go into individual bags? Thank you Carl. I like to chop up the cape and have them in the bags, ready to go. I separate the capes into pieces so that I have hackles in the different pattern containers. Anything to save me tying time! I use a cafeteria tray to tie in. It pretty much catches everything, and makes finding tools very easy.